Several text and image segments connected visually in a state-based manner such that the process of viewing them changes their arrangement and availability. From Closed Rooms, Soft Whispers is an interactive narrative concerning the passage of time and leveraging augmented reality for its display. The story is composed of several text and image segments connected visually in a state-based manner such that the process of viewing them changes their arrangement and availability. Gallery installation consists of hanging three collage pieces, an hourglass on a plinth, and a small cabinet. 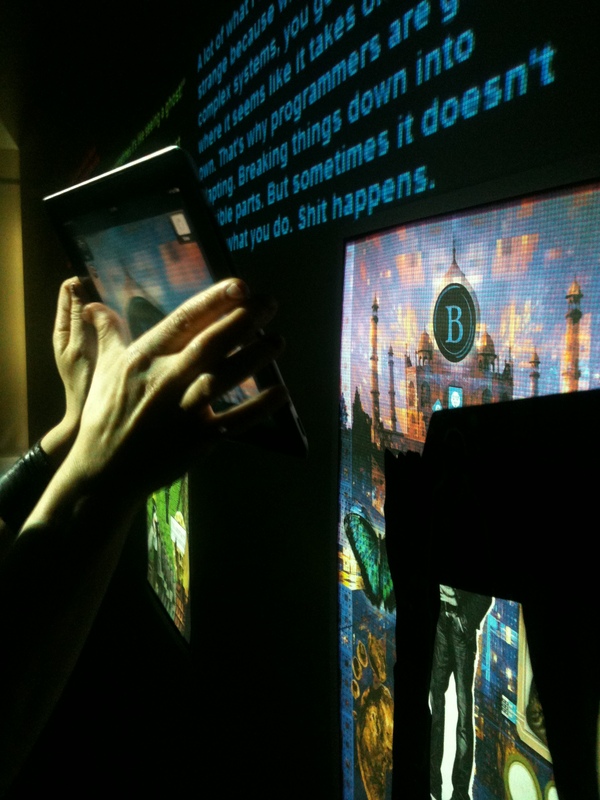 Viewers use their smartphones or provided iPads to view the elements and interact with them, which in turn modifies the database the narrative is stored on such that the content pool driving the other collages is changed. Thus, the viewer’s experience moving piece-to-piece is one that is contextually driven. The first part paints the scene of three characters that are close friends. The order the posters are viewed in determines which one of the friends is removed from the narrative by the end of the scene. Viewers then go to the hourglass, which has a symbol on the top and bottom. The viewer views these symbols through their device. The order they view the symbols in determines which of the two remaining characters is cut from the story. The last stage is a small cabinet which opens one of six compartments depending on the pattern knocked upon its top. The pattern is revealed to the viewer in the hourglass text. The object within the drawer will symbolically represent the unique state of the remaining character for that reading, and displays the closing text when seen through the viewer. From Closed Rooms, Soft Whispers is concerned with humanizing a high-technology concept through interaction with real world objects, blurring the border between the physical medium and the digital media overlaid upon it. Its focus is how memories and feelings are triggered and re-experienced through objects all around us, providing a symbolic afterlife for the people and events they evoke, long after the passage of time has removed them from our lives.